This week in A-ha!, Miriam Weisfeld from Woolly Mammoth (A-ha! Round 1) reflects on her sabbatical at the Smithsonian National Air and Space Museum, and how she ended up there in the first place. As Woolly Mammoth’s Director of New Play Development, I’ve long suspected parallels between my dramaturgical work and the work of curators and exhibit developers at the many museums that surround our theatre here in Washington. In July 2009, Woolly Mammoth co-hosted the annual Literary Managers and Dramaturgs of the Americas conference; we included a session called “Dramaturging the Museum” with representatives from the Newseum, the Smithsonian National Air and Space Museum (NASM), and the Folger Shakespeare Library. This fascinating conference session confirmed my instincts, and I called the Director of Exhibits at the Newseum to ask whether I might spend a sabbatical observing her work. I was intrigued by the Newseum because their journalistic focus seemed particularly interesting from a dramaturgical perspective: journalists make constant choices about the authority, bias, and context of covering a story—surely these questions were central to the Newseum’s choices as well. And the Newseum was on the cutting edge of broadcast technology, with actual TV and radio studios embedded in the museum—an exciting way to see how electronic media can help shape a live narrative experience. I had lunch with the Newseum’s Director of Exhibits and we discovered a common passion to bring together stakeholders from DC’s various cultural institutions and provoke fresh exchanges. But after a series of phone calls, emails, and meetings, the Director of Exhibits was unable to convince the Newseum’s administration to grant permission for me to observe her work. The administration’s concern was the blog you’re reading now: since I planned to document my observations on the TCG website, I might reveal plans for Newseum exhibits before the museum was prepared to release that information to the public. The Director of Exhibits sheepishly acknowledged the irony of a journalism museum squelching my First Amendment rights. But, she explained, the Newseum is a private corporation which depends on ticket sales to stay in business; therefore, the corporation closely guards their marketing and communications strategy. Fired up by this challenge, I contacted Barbara Brennan, the Director of Exhibit Design at NASM. Soon I was sitting in her office, telling her about my frustrated attempt to collaborate with her counterpart at the Newseum. Barbara shook her head in surprise. She pointed out that when NASM exhibits are under construction on the museum floor, the safety barriers are deliberately kept low enough for visitors to watch the engineers installing and repairing aircraft or spacecraft. Sometimes, she said, engineers will take breaks to chat with the visitors about the new exhibits they’re assembling. The Smithsonian Museums, Barbara told me, “belong to the public,” and therefore seek to be transparent whenever possible. Fortunately, Barbara also had a personal interest in trading information with me: she was originally trained as a theatrical set designer. I learned that one of her major accomplishments at NASM was an exhibit on the Wright Brothers that included performance spaces where actors playing Wilbur, Orville, and their sister to perform a miniature play for museum visitors. The exhibit was meant to be temporary, but its popularity won it a place in the museum’s permanent collection-- even after funds ran out to pay for actors and costumes for the play. Since then, Barbara had been itching to revisit performance in the museum space. We agreed I would spend a week exploring NASM, shadowing Barbara’s work, and brainstorming about connections between museums and theatres. My first meeting at NASM felt a whole lot like season planning at Woolly Mammoth: I watched Barbara sit down with a photographer and a designer to discuss the rotation of temporary exhibits in NASM’s art gallery. For each show, they roughed out a budget for paint, lighting, and banners. Each exhibit, I learned, must be approved by the Public Programs Committee; in their pitches, designers must propose a strategy for funding each show. I told Barbara I was surprised by how immediately design planning became a budgeting task. She nodded, explaining that pairing donors with exhibits at a public museum could be a highly sensitive issue. For example, one artist had assembled a collection of NASM-related works and volunteered to pay to install them in NASM’s gallery himself. “Does that mean private artists are buying space here?” she asked. This led us to a conversation about the weight of the Smithsonian’s perceived fairness and authority. Many exhibit developers, I learned, feel compelled to communicate a straightforward narrative that the museum’s partners—NASA, say, or even Boeing or Lockheed Martin—can approve. The range of stories told at NASM is also dictated in part by the collections the museum already owns. There have been many female aviators more accomplished than Amelia Earhart, Barbara pointed out. But the museum owns far more memorabilia of Earhart than of any other aviatrix—largely because Earhart so successfully cultivated her own celebrity status. A theatre like Woolly Mammoth, on the other hand, enjoys a relative freedom to tell stories that deviate wildly from the “official” historical record—but is anyone listening? Woolly Mammoth will never have the number of visitors that NASM hosts every year. Is there a way for Woolly to be heard by more people, and for NASM to represent more unconventional voices? Barbara and I decided to talk more about narrative, performance, and audience with exhibit developers from other Smithsonian museums to get their perspectives. A couple days later, Barbara and I hosted a pan-Smithsonian “brown bag lunch” for exhibit designers. The topic was “theatrical performance in exhibit space,” and we drew quite a crowd—I met representatives from the National Museum of the American Indian, the National Museum of Natural History, the Smithsonian Center for Education and Museum Studies, the Zoo, and two museum authorities from outside the Smithsonian Institute who also heard about the lunch and wanted to join. We traded stories about stage combat performances at an arms museum in Kentucky; a comedy sketch about composting at an antebellum plantation home; a puppet show about frogs at the zoo. Most performances were conceived for children and families, but Vincent Scott, a Program Specialist from the National Museum of the American Indian (NMAI), described intensive collaborations with sophisticated Native American theatres and performers. We discovered that NMAI enjoyed an unusual degree of administrative support for performances—and this connected to the question of narrative authority. By devoting museum space to Native performers, NMAI allowed Native Americans to tell their own stories in their own voices rather than via Smithsonian curators. Vincent pointed out that this sometimes caused discomfort for visitors: a performance of the Thanksgiving story from a Native perspective, for example, contradicted the narrative that many visitors accepted as true. I wondered what kind of meta-theatrical framing NMAI had used to bridge this distance between performers and visitors. Vincent said program notes and discussions with the artists sometimes helped. But even “theatre etiquette” was unfamiliar to many museum visitors; we hard complaints about noise, sightlines, cranky docents, and other barriers to performance in spaces not built for live actors. The duration of performances proved a universal challenge. Visitors often devote only a few minutes to each exhibit—particularly at Smithsonian Museums, which are free (“They get their money’s worth,” Barbara lamented). And then there was the cost of performers. Even when administrators agreed to incorporate live performance into exhibits, Equity rules often constrained live performance, webcasts, and other electronic means to reach a wider audience. Despite these challenges, the exhibit designers all enthusiastically embraced the idea of theatrical collaborations. I asked how we could work together to overcome some of these challenges: could actors perform five or ten minute teasers of plays during the day that are performed in their entirety at the theatre in the evening? Could we keep in touch as we plan our seasons to coordinate plays and exhibits that commemorate the same historical events and social questions? Could we consciously use the theatre as a platform for the voices of diversity and dissent not always represented at the museums? Theatres could certainly grow by reaching museum visitors, but could performances actually diversify museum visitors? For example, could theatre help lure more women to science and engineering exhibits? We talked about the International Museum/Theatre Alliance; a study of these collaborations by the University of Manchester; and other potential resources. The Smithsonian Commons, a new pan-Smithsonian website designed to share information across the Institution and among visitors, might help shake up the “burden on authority” and democratize museum narratives. We agreed to keep the conversation going and explore more concrete ways to work together. 2) NASM sometimes presents lectures that aren’t an ideal fit for their IMAX theatre. Are there museum-related events that might fit better in a theatre space than a museum space? 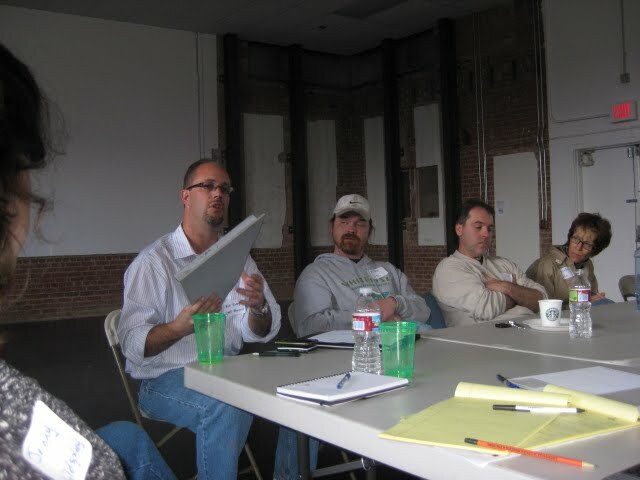 Could a downtown theatre like Woolly Mammoth be helpful in these cases? 3) Theatres plan most of their shows 1-2 years in advance; is there a way to coordinate this schedule with exhibit planning? What might be an effective model for sharing information about upcoming anniversaries, national, international, or environmental events that could inspire collaboration? 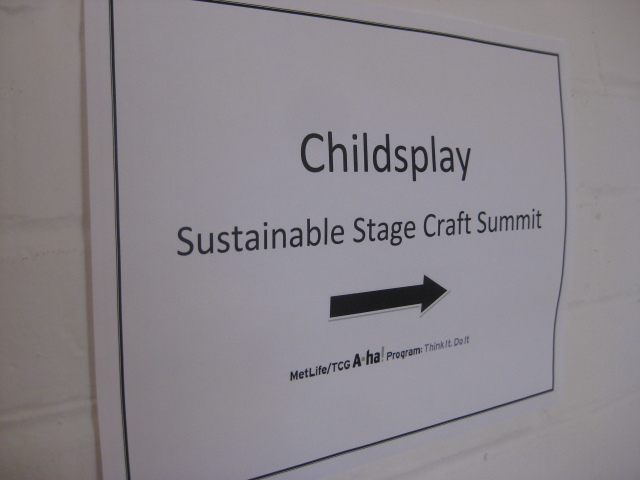 On February 26th, Childsplay and members of the ASU Global Institute for Sustainability held the first of three Sustainable Stagecraft Summits. We brought together production staff members from Arizona Theatre Company, Actor’s Theatre of Phoenix, and the theatre department at Scottsdale Community College to discuss the materials we use in scenic construction: what we like about them, what we wish we could change, and how we could find more sustainable sources for our materials and dispose of them in a more responsible manner. The first part of the morning focused on the types and sources of materials used in scenic construction. Our conversation quickly narrowed to the amount of lauan consumed by the theatrical industry, a problem that was put into real terms by Childsplay’s technical director, whose stories of travel through the devastated Indonesian rain forests inspired Childsplay’s quest to find more sustainable alternatives to our current practices. Jeff brought samples of eco-friendly plywood alternatives currently being used in the architectural design world made from wheat, bamboo, and sorghum straw. The challenges with applying these materials to theatrical uses included: 1) the materials are manufactured for finished work (e.g. furniture, floor, cabinets, etc.) and cannot be purchased in raw form; 2) the materials are not very flexible or durable and probably could not withstand the rigors of trucking and the wear-and-tear of a performance run; 3) the expense alone is up to 10 times the price of lauan, and 4) wheat board, the most practical of the materials options, is not yet manufactured in a ¼” product. See the video here: Jeff Lemire of Childsplay shares samples of plywood alternatives with summit attendees. 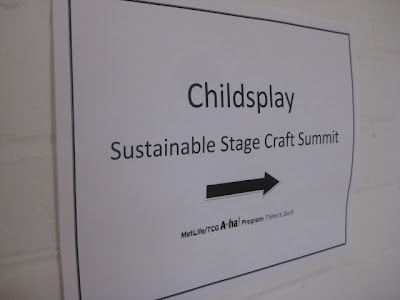 Childsplay - Sustainable Stagecraft Summit 1 from Anthony Runfola on Vimeo. We welcome your feedback about these properties and intend to use this information in future conversations with manufacturers. The victory of the day was the discovery of a regional commodities recycler who would accept far more of our scenic materials with less preparation at strike than we had ever anticipated. At the close of our next show, we will be coordinating with them to take our scenery to recycling right from the loading dock of the theatre. We will also be working with this company to develop recycling resource information specific to theatrical productions, which we will share with you all in the days to come. The success of this summit was due in large part to its focus on immediate, practical solutions for making stagecraft more sustainable. 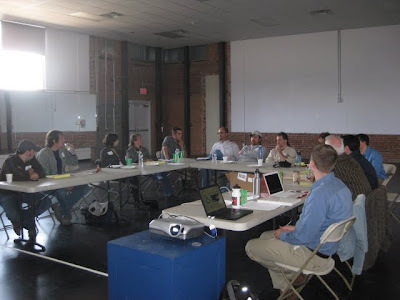 Everyone walked away from the meeting with a new piece of information they didn’t have before. All participants expressed a desire to build a model of sustainable material and to form partnerships that enable this model’s success. The group also agreed that they wanted to keep communicating with each other in person – we were all thinking the same things individually and just not talking about it with our colleagues. Thanks to TCG for bringing us together! To learn more about this summit and our next steps, please visit the Childsplay website at www.childsplayaz.org and look for the Sustainable Stagecraft link. On February 28th, the Austin Scenic Coop (a collaboration between Salvage Vanguard and Rude Mechs) held a work day to clean the storage area at Salvage Vanguard Theater where much of the inventory will be housed. 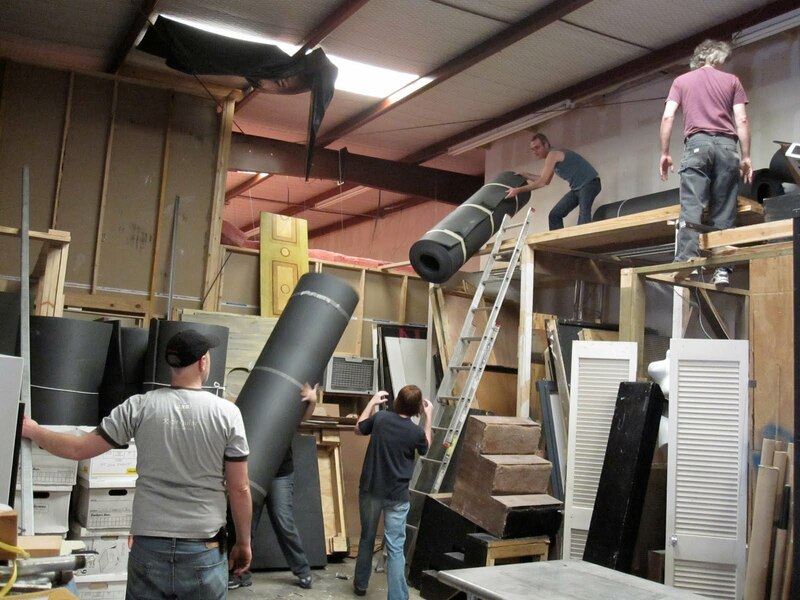 A dozen volunteers cleared out old, unusable equipment and material, and built storage bays, shelving, and lockable cages. 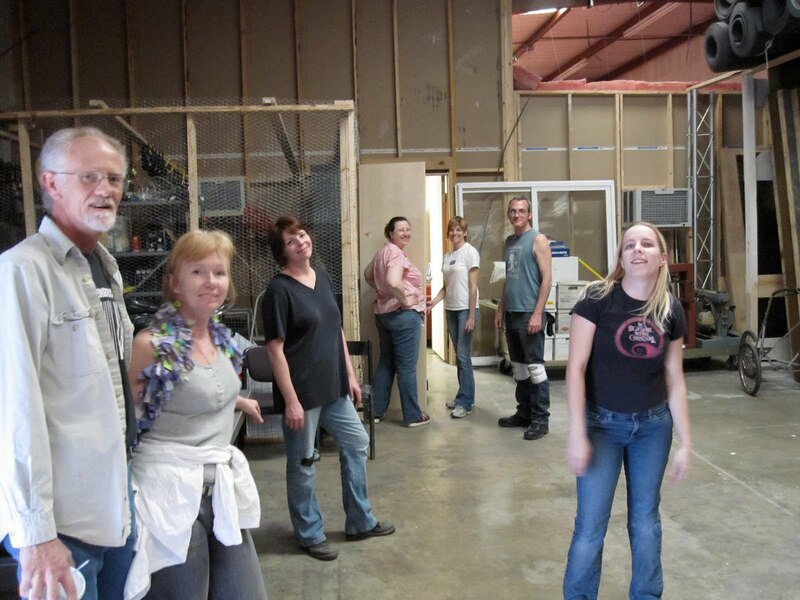 Paint, flats, platforms, step units, doors, windows and "other" now have a space of their own, and there is plenty of room for the creation of an office and meeting room, as well as for hosting rehearsals (beginning March 1). What Questions Should an Asian-American Talent Agency Ask? East West Players has received some enthusiastic feedback from our long time community partners who have generously offered support (such as relaying good contacts in the industry for further research). These partners have also raised good questions we should consider. Here are some questions we knew we would be asking ourselves when we broached this new venture. We welcome any other questions you may be interested in as we continue in our information gathering! • What are the financial bottom lines? What would it take for the agency to support itself and the theatre? • What are possible legal, financial, and organizational ramifications of institutionalizing these activities in our standing non-profit model? 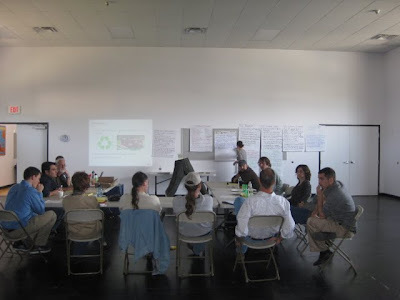 • How do we structure an APA-focused agency so artists feel empowered and better supported? • How would producers, Film/TV, and other theatres perceive its value? • What new niche would this prototype create in bridging the worlds of theatre and Film/TV to support the careers of our artists? This week, an update from Woolly Mammoth (of Round 1 fame). 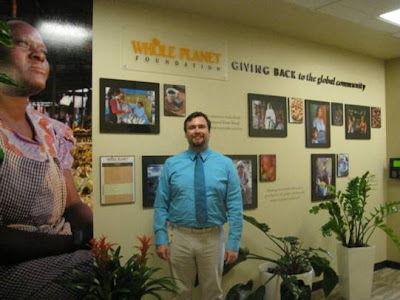 Aaron Heinsman spends some time with the Whole Planet Foundation, re-ignites a passion for development (truth! ), and reminds us that transparency is not always as easy as it sounds. Annual Fund Director Aaron Heinsman here, reminiscing on Day 7 of last summer’s Texas Adventure. I had just spent 5 days in San Antonio for the annual Tessitura Learning & Community Conference, cramming my brain full of new tips for effectively harnessing and exploiting the power of our integrated donor/ticketing software and meeting, networking, and befriending fellow arts professionals in multiple disciplines from seven countries on three continents. Austin: Texas’ proud capital city and a blue bastion in a red state. I had hoped to be spending a week with the amazingly dedicated five-member team of the Whole Planet Foundation—the philanthropic arm of Whole Foods dedicated to raising communities, specifically those which source their products, out of poverty through microlending. 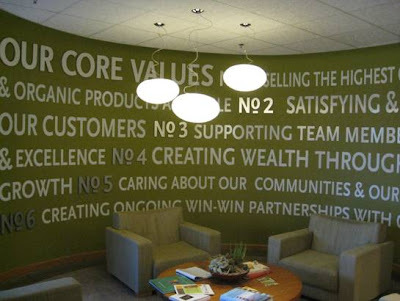 It’s corporate philanthropy in perhaps its purest form: driven by the core values of its parent company with little emphasis on tax benefits, visibility from its beneficiaries, or the bottom line. Beyond that, both Whole Foods and Woolly Mammoth are celebrating their 30th year of operations and both are still led by the extraordinary vision and dedication of our respective founders, a synergetic coincidence. Due to the small nature of the Foundation’s staff and the fact that they are more often than not in the field seeking out more communities and opportunities for support, I was only able to have an informational meeting with Joy Peterson, their Director of Partnership Development & Internal Programs. That said, while my visit was too brief to yield specific innovative ideas, what it did serve to do—particularly coming on the heels of my time in San Antonio—was serve to reactivate my enthusiasm for the actual work of development. Yes, at its root, development is fundraising. But the funds cannot be raised without having created some form of relationship first. And it is this—the nurturing of deep, highly engaged and personal connections with our patron-funders—which I felt both eloquently reminded of during my conversation with Joy and also validated. We shared a few stories of where we’re headed as people-driven organizations and realized that we’re on the right track. We agreed that to succeed you need to be true to a genuine, yet dynamic mission and, more importantly, have an energized base. For Whole Planet and Woolly Mammoth to continue to thrive and succeed in the long run, we have to have real, actual stakeholders, whether they are vendors, team members, and customers or donors, artists, and patrons. If I got this much out of a single morning, I can’t wait to discover what a whole week will yield…which has proven quite tricky! I’ve made three concentrated efforts at sabbatical placement since whetting my appetite in San Antonio. One was to a major national foundation highly supportive of theatre, and the other two were to large regional banks with operations in the Baltimore/Washington area. All three organizations are ones where I have professional connections. And yet, and yet…no one seems quite willing to let me inside to view their operations and, hopefully even, assist them practically speaking. Transparency is such a difficult thing for organizations to embrace. But I haven’t give up! Stay tuned for more tales from Woolly folks….